Lola nearing the top of a climb. If you live in Cape Town, as the wind howls outside and the frostbite eats its way into your bones, you will agree without a shadow of a doubt, that winter has arrived. What felt like a very short summer, has now departed, leaving me feeling a bit like a hound in pursuit of an elusive rabbit. As I chase the last remains of summer around the city, I am beginning to realise the importance of finding some awesome indoor activities to do with the kids, with stress on the word active-ities. 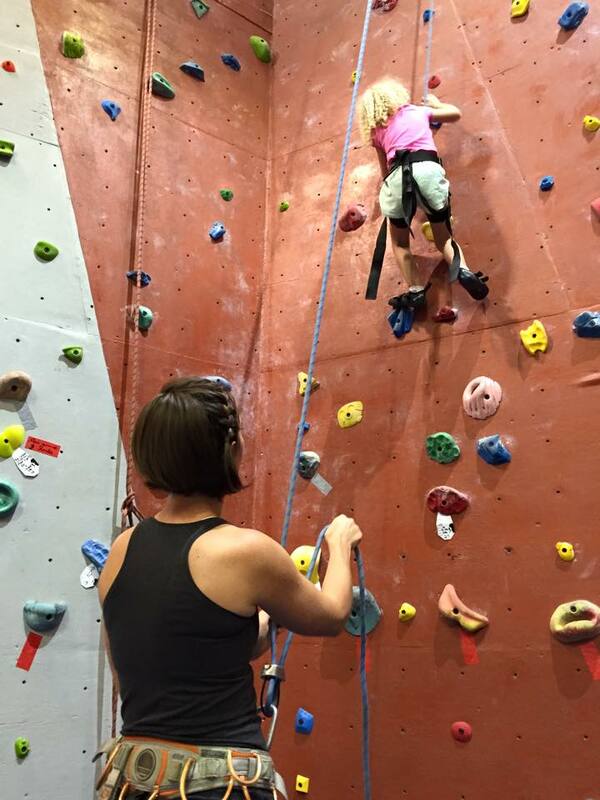 So with rain on our doorsteps and wind at our backs, we found ourselves brazenly heading into CityRock, Cape Towns indoor climbing gym. I say brazenly not because we are overconfident in our abilities, but simply because we are going there at all. Two very rusty adult climbers and a four and five year old are rather an oddity at a place like that, but we did not let that deter us. Shaun climbed in his youth, when his arms lacked the strength to get him to the top of a climb, his heart got him there. My heart has never carried the strength to get me up a sheer wall. When my arms failed me I simply hung there like a limp duck. Truth be told, I wasn’t all that interested in getting to the top. Heights scare the hell out of me and the thought of sheer willpower getting me up was simply not an option, I lacked the will. A lot can change in twelve years, the addition of two children not the least of it. So after kitting ourselves out with style deterring, yet robust harnesses, we hit the walls. Lincoln was strung up in a full body harness, his climbing abilities and lack of appropriate fear calling us to place him in the most secure outfit we could find. Lola, along with Shaun and I, stepped gingerly into our crotch harnesses and secured them to the appropriate tightness, where any hint of a bulge is encouraged to take shape into a full flung bakery selection. Truly a style essential. Feeling right at home with the other trend setters, we scoped out the walls, finding what we thought would be the easier routes. All routes are marked with their level of difficulty, so if you know your level of skill, you are sorted. If you know your level. The children were actually easy, Lincoln took off up the wall with his customary ease, like his father years ago, his heart carried the strength his arms did not. The top did not elude him for long. After squashing Lola’s initial nerves, she took to it like a fish to water. 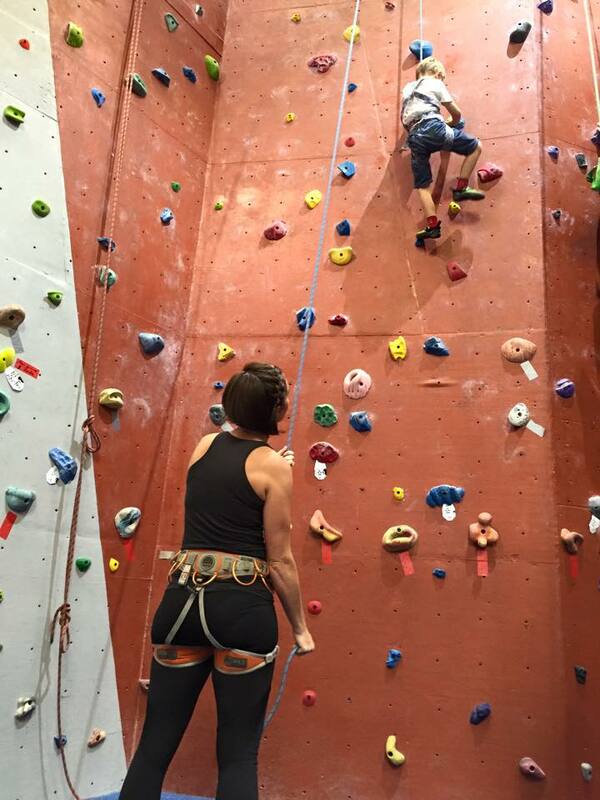 After squashing my initial nerves, I was instructed by Shaun not to be a sissy, and to climb an ‘easy’ route, one he could do easily in his youth. He assured me anything less would be beneath me. I need not explain the lengths to which I couldn’t begin to climb this particular route. About four handholds in and I flaked out, effortlessly sliding back into my limp duck impersonation. This was not starting off well. Whilst desperately trying to stifle his laughter, Shaun told me to stop being so lame. I just needed to watch how he did it. 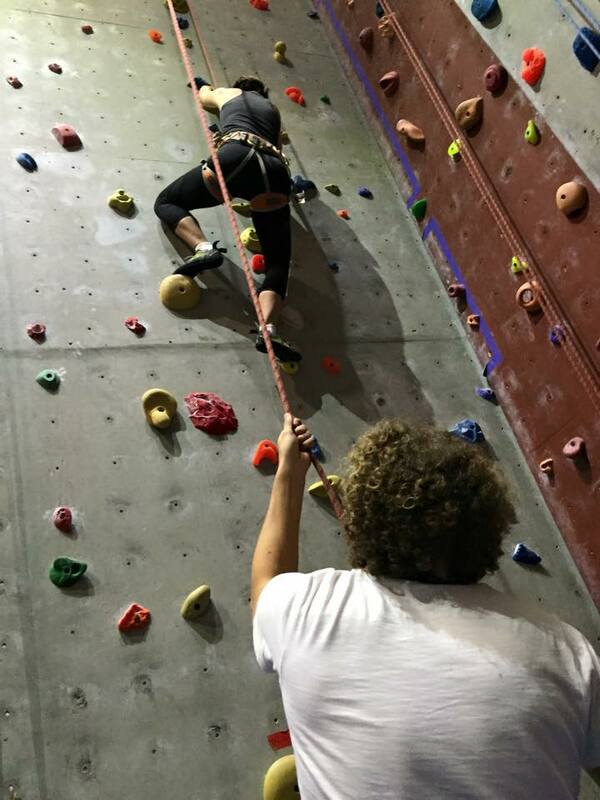 Without undermining my husbands physical prowess, he didn’t get any higher than I did. This came as rather a surprise to both of us. Now both feeling a little sheepish, we began searching for routes that looked more to our adjusted skill level. Meanwhile, the children climbed happily up any wall, they obviously weren’t trying to stick to any particular route so the handholds were plenty, although spaced with adequate distance for their little legs and arms that it was still quite challenging for them. They enjoyed the climbing so much that they protested with vigour when Shaun and I wanted a turn to climb instead of just standing sentinel at the bottom. 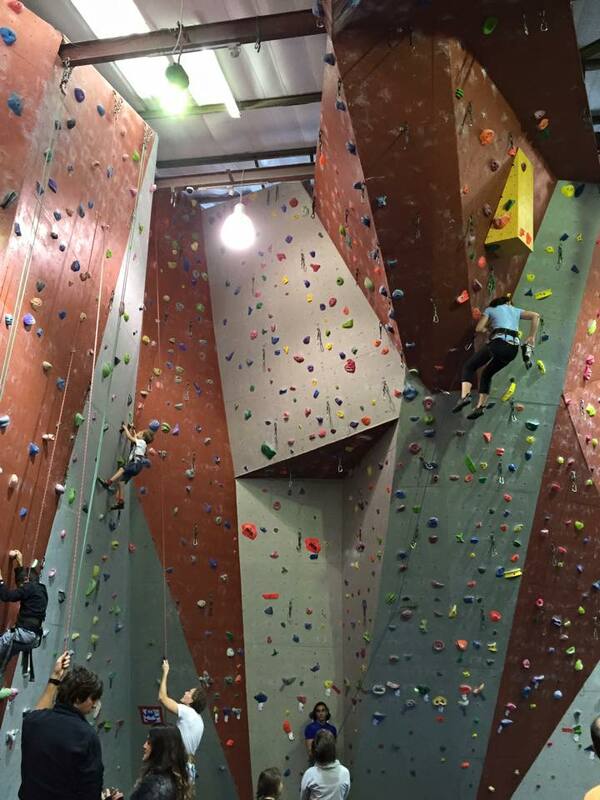 If you have never climbed before, the basics are; you need to be in pairs (of equal-ish size). One person climbs while tied rather dramatically to a rope, while the other person, called the ‘belayer’, holds the other end of the rope at the bottom. 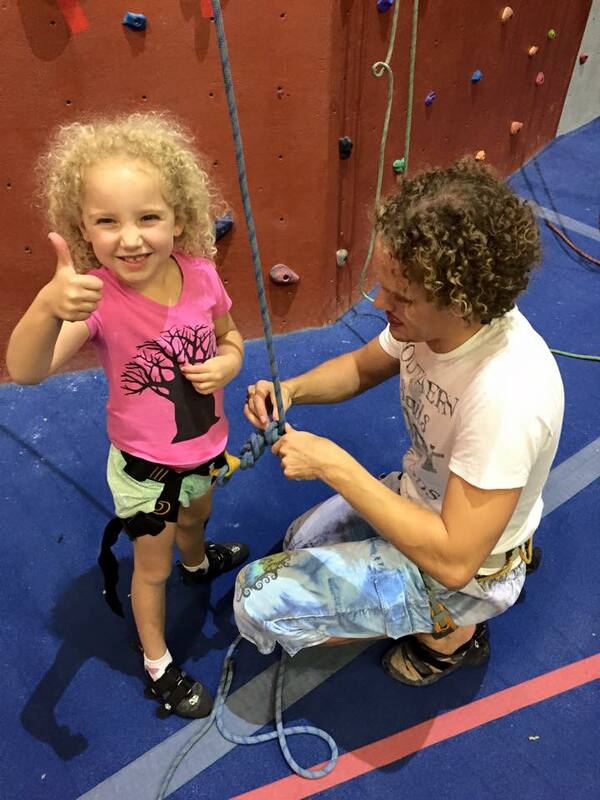 The idea being that if the climber falls, the belayer will catch the tension in the rope (it is threaded through a loop at the top of the climb) so the climber does not fall, simply hangs in mid-air supported by the person at the bottom. This would explain the necessity of size, Lola for example would not be able to support my weight, or have the skill to hold the correct amount of tension in the rope as I climb. Shaun and I could each belay one child, and then take turns with each other while the kids rested and refuelled in the little canteen. It worked quite well, although belaying uses more strength than you would imagine. We arrived mid afternoon and thought we had left ourselves too little time to climb, but at closing time, 3 hours later, we were all exhausted. Shaun and I both had shaky hands from all the rope tying and belaying, not to mention the lizard acrobatics up the walls (much to our relief, and debilitating state of embarrassment, we did improve as the afternoon went on). After a rocky start, we can’t wait to get back there! Yes, yes and yes! Incredibly good strength training for us all, as well as teaching the kids coordination, perseverance and giving them mountains of fun! Incidentally I enjoyed it way more than I did in my youth. The cost. It is not a cheap exercise. For access to the gym, as well as hiring of shoes and harnesses, it cost in the region of R500 for the family. But to put that into perspective, it’s not much more than a meal out, so don’t gasp too audibly. 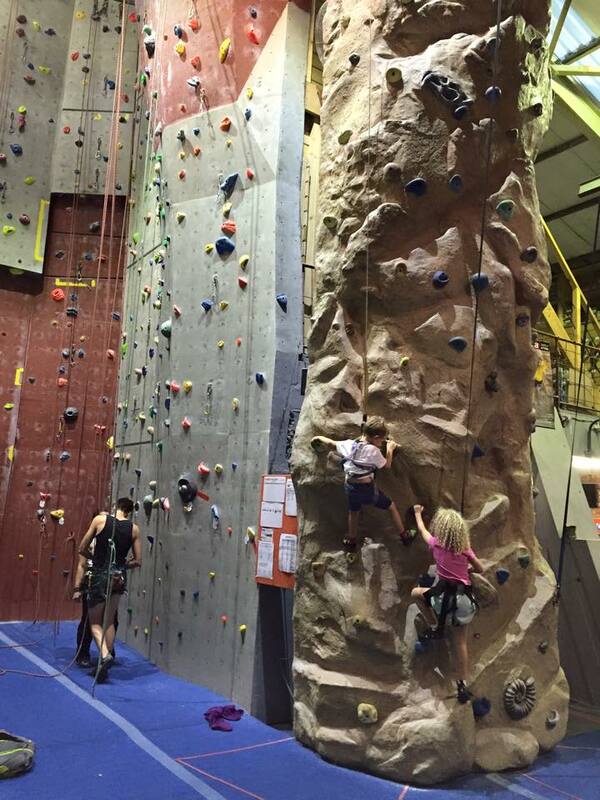 It is good wholesome family fun, and you can stay and climb for as long as you like. 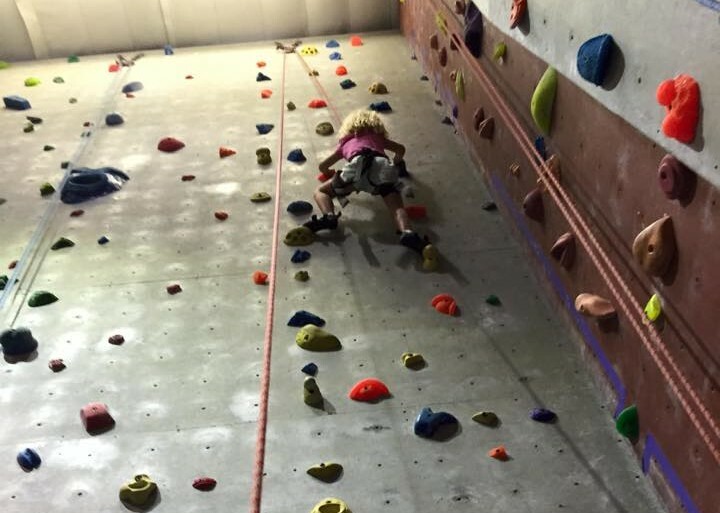 Children also need to be 5 years old to climb.